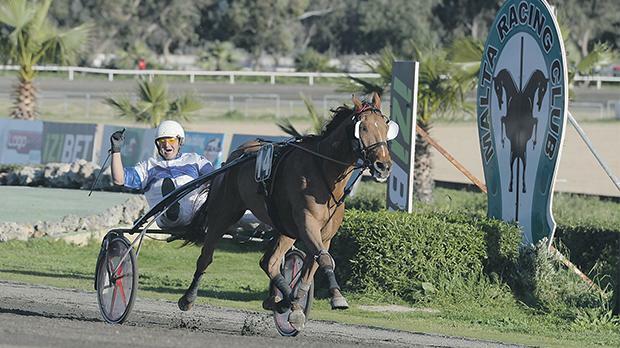 The class Premier race and the three Assikura Championship semi-finals, for class Bronze trotters, headlined yesterday’s seventh meeting of the season at the Marsa racetrack. Fifteen trotters took part in the class Premier race. Three horses surged ahead during the first lap, Rififi Nonantais (George Attard), Sage De Gueriniere (Jesmar Gafa’) and French newcomer Top Speed (Eric Bezzina). However with 500m to go, a keen tussle developed between French Service Secret (Andrew Farrugia) and Italian Overtaker By Sib (Marco Refalo). It was Service Secret which cruised to its second consecutive win at the Marsa racetrack. Rififi Nonantais and French newcomer Tanguy De Nappes (Ronald Cassar) ended respectively in third and fourth place. The winner clocked an average time of 1.17.3” per kilometre. The three semi-finals from the Assikura Championship were held on the short distance of 2,140m. In the semifinal, Clint Vassallo put favourite Ukase Du Ravary in front with almost a lap to go. This French trotter sealed its second win in a row by two lengths and a half from Nisio MRS (Julian Farrugia) and Zootaren (Noel Baldacchino). Univers Des Fanes (Paul Galea) ended in fourth place. Another favourite trotter, French Sirocco De Line (Neville Spiteri) dashed strongly from the outside during the last 300m of the second class Bronze semi-final. Spiteri’s trotter took the lead midway through the final straight and passed the finishing post first easily by six lengths from All American Class (David Ellul) and Alexis Le Grand (Shawn Portelli). Charm Hammering (Gilbert Farrugia) followed home in that order. In the last semi-final it was also Charm Blou (Rodney Gatt) which registered its second win in Malta. This six-year old mare outsmarted early leader Voila Dry (Ivan Bilocca) midway through the final straight. Voila Dry also changed its pace and was disqualified. Ohdarling Effe (Carl Caruana), Tavumm (Omar Cauchi) and Tulsa (Michael Sultana) were the last horses to make it to the final.